Stephen King’s Silver Bullet certainly has its fans. It’s not one of the best adaptations of the author’s work, but it is far from the worst. There’s something almost charming to the fact that it wears its problems on its sleeve. Some people love the movie, some people hate it, but everyone knows exactly what the issues with it are. Most viewers are perfectly able to see Silver Bullet for what it is. Yet it may surprise people to learn what it almost was. Because Silver Bullet could have been a very different thing. The muddled, pseudo-B-Movie was the result of a long and troubled production. And while it remains a personal favorite for me and many other fans, there’s no doubt that Silver Bullet really could have been something spectacular if everything had come together. While Silver Bullet is credited to first-time director Daniel Attias, it was initially helmed by Don Coscarelli. While finishing up Phantasm II, Coscarelli was brought in to a meeting with Dino De Laurentiis who at that point exclusively owned the rights to all Stephen King adaptations. At that point, De Laurentiis didn’t speak a word of English and communication between the two was rocky from the start. When Coscarelli had the initial talk about taking the project, Stephen King’s Cycle of the Werewolf was not yet even the novella it became. At that time, it was simply a calendar with a brief short story for every month. The director had the impossible task of, at that point, trying to adapt a calendar into a movie. Still he went off and penned the initial script, then set up a meeting with Stephen King to talk about it. King offered back his notes, which De Laurentiis promptly threw in the garbage. At some later point, King was brought back in to write the full screenplay and remains the sole credited writer on the film. There’s quite a bit of debate as to how much of Silver Bullet was actually directed by Don Coscarelli. Some sources claim that every scene without the werewolf in it was his, others claim he directed much less than that. The director has even almost suggested that he directed none of the actual film, which is puzzling because this is already widely believed not to be true. Major aspects of the script did not make it into the final product, one of the most surprising being that—in King’s screenplay—the werewolf actually speaks. It is given full lines of dialogue. Whether it would make the movie better or worse is hard to say, but it would definitely be a very different experience. 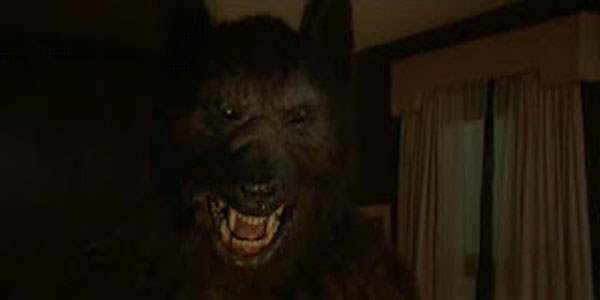 The look and characteristics of the monster were the biggest problem throughout the production, which is certainly an issue on a werewolf movie. Ultimately what could possibly hinder a werewolf story more than a failed werewolf? Not that the film itself is a total failure. There are great moments in Silver Bullet. Some of the kills are very effectively done, but this is mostly because the werewolf is hidden. More often than not, this is the way to go in any form of horror. The monster is scariest when it is in the shadows, unseen. The movie has its share of flaws, to be sure, but there are some wonderful moments. It’s about a boy with problems he’ll never overcome. Marty knows he will never walk again, and there’s nothing that he can do about it. But this werewolf is a problem that he can take into his own hands, something that he can actually beat. It’s also very much about his relationship with his sister. Trying to stop this monster becomes the thing that brings two very different, unconnected siblings together. Gary Busey gives one of his best performances as the deadbeat Uncle Marty can’t help but look up to, who feels an obligation to believe Marty’s story whether he actually wants to or not. Stephen King’s script is there. The problems that stopped it from being truly great are not at the story level and that’s one of the major things that stopped this from being a total flop. Even with massive directorial and production problems, Silver Bullet is not a terrible movie. It’s good. But it could have been one of the greats. It was so close to being one of the all-time best werewolf films. If one or two things had been different, maybe it could have even been in the same league as An American Werewolf in London, and The Howling. But too many things got in the way. Instead of getting a modern classic, we were left with something good. It’s easy to still enjoy Silver Bullet knowing that, but nonetheless hard not to wonder what could have been.